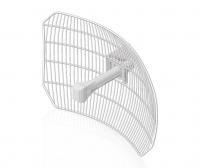 robust “all-in-one” design and light weight of airGrid M make it versatile and ideal in several different applications. time slots managed by an intelligent AP controller. This “time slot” method eliminates hidden node collisions and maximizes airtime efficiency. Compared to other systems in its class, the airGrid M delivers superior performance in reduced latency, throughput, and scalability. • Intelligent QoS Priority is given to voice/video for seamless access. • Scalability High capacity and scalability. • Long Distance Capable of high‑speed, 30+ km links. With its updated mechanical design, assembling and disassembling the airGrid M is literally a snap. No tools are required. You simply snap the feed, antenna, mounting bracket and rear housing together for a secure, solid assembly.